Has longer legs, slightly elongate body. Both differences give him an inarguable advantage in difficult terrain. Moderately dressed. 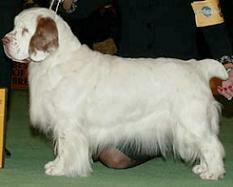 According to the breed standard, an underdeveloped coat is a minor fault, while an extra rich coat is a serious fault. Trimming is not allowed. 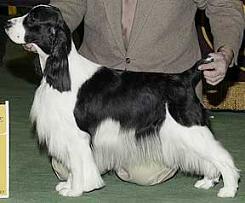 Has a rich beautiful coat that required serious care and regular trimming. Scull is well developed: from the side and front it is arched and slightly flattened. 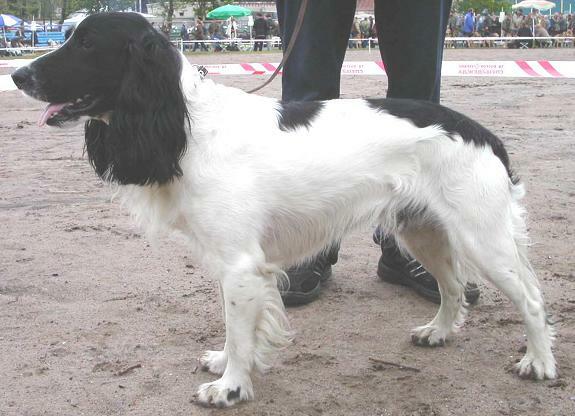 Muzzle profile is rectangular. Ear is set very low. Head of the RS is much lighter. If looked on from above, the scull is oval, slightly wider to the back. Transition from forehead to the muzzle is much smoother but clearly defined. The nearly level line from occiput to brow is set a little above, and parallel to, the strait and equal line from eye to nose. If looked on from above, muzzle is wide, slightly narrower than the scull and narrowing a little towards the nose. 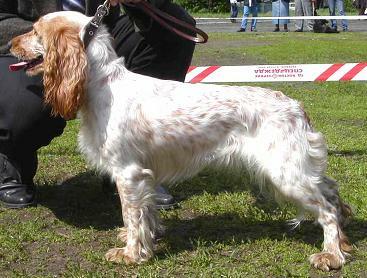 Jaw is moderately deep, the underline being almost parallel with top line of the muzzle. Upper lip is almost rectangular but rounded in the front. Head of the Springer is impressive. The scull is medium-length and fairly broad, flat on top and slightly rounded at the sides and back. Transition from forehead to the muzzle is very well defined. The muzzle is one half the width of the skull. Jaws are fairly square. The upper lips come down full and rather square to cover the line of the lower jaw. 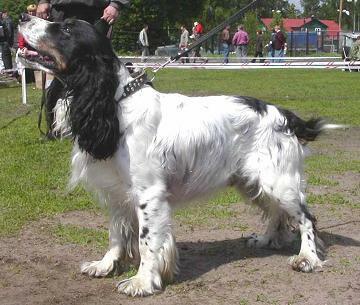 Has a rich coat that required serious care and regular trimming. Has longer legs, slightly elongate body. Head has strictly parallel lines of the scull and the muzzle. 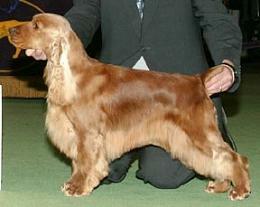 Ears well covered with long, silky, straight or slightly wavy hair; the leather should be able to reach to the nose. The top plane of the scull is very slightly divergent from that of the muzzle, but with no tendency toward a down-faced appearance. Ears are comparatively small, shaped somewhat like a vine leaf and are lightly feathered; the leather does not reach to the nose. The color is rich red and white only. 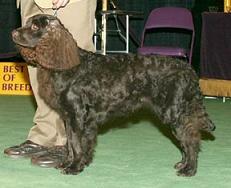 Black, liver, golden liver; either self-colored or bi-colored. Head is elongated. Scull appears oval if looked on from the top, and flat if looked on from the side. 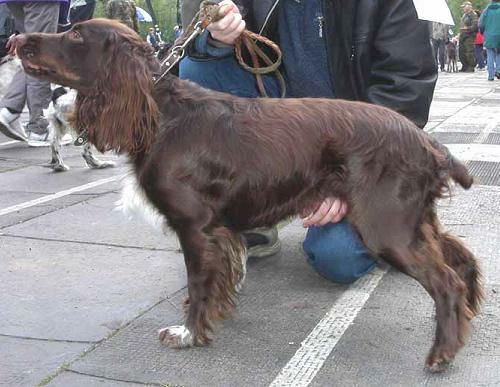 Muzzle is long, with the upper lip almost rectangular but rounded in the front. Head is moderate in length. Scull rather broad and full. 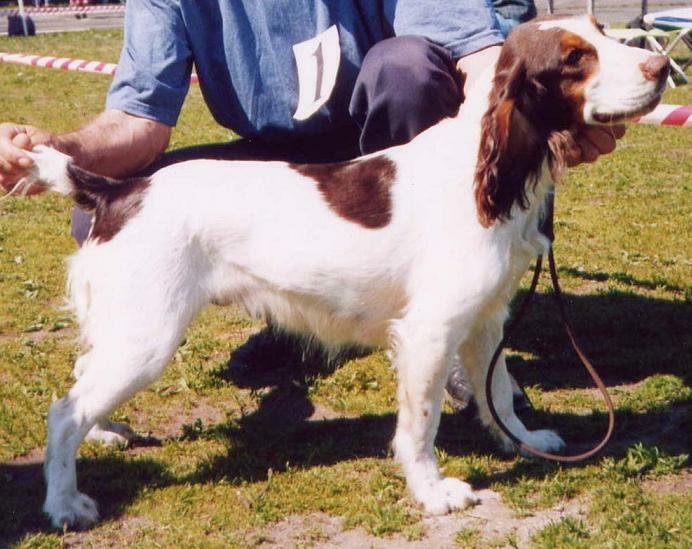 Muzzle moderate in length, square with good depth. The coat is naturally straight flat and soft to the touch, never wiry or wavy. 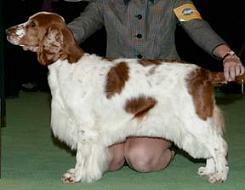 The coat can be closely curled or uniformly waved. 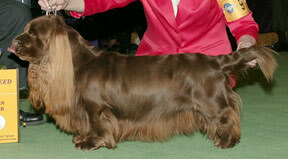 Coat color is solid liver or dark chocolate. The scull is moderately wide almost level in the dome. 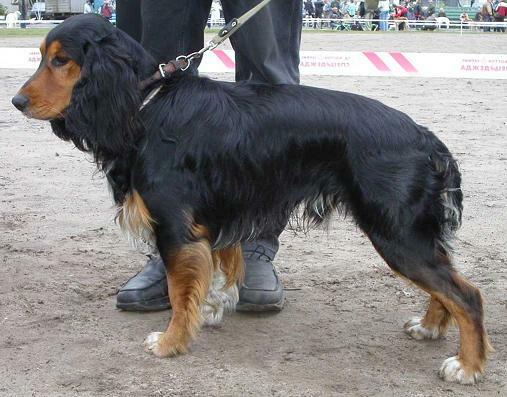 The coat cover on top of the head is short, straight and flat Ears are set at the eye level or slightly higher, well covered with long, silky, straight or slightly wavy hair. The scull is rather large and high in the dome. 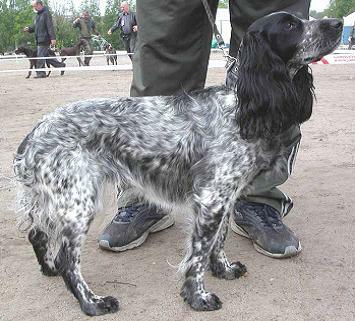 Carries the topknot, the characteristic of the breed, which consists of long, loose curls growing down into a well-defined peak between the eyes and falling like a shawl over the tops of the ears and occiput. 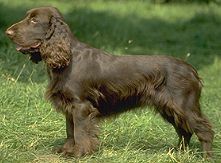 Ears are long, set low, abundantly covered with long curls. 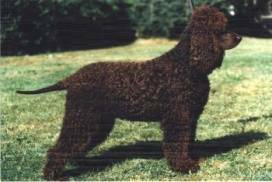 Covered with abundant curls or waves except for the face, throat, tail, and rear legs below the hocks. Tail is straight, evenly feathered, docked at half length. 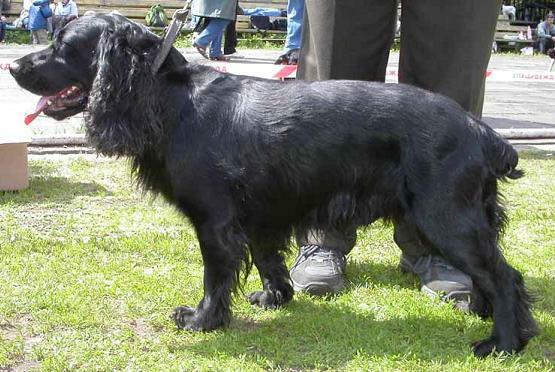 The "rat tail" is the characteristic of the breed: at the root it is thick and covered for two or three inches with short curls, and it tapers to a fine point at the end and covered with short, smooth hair. The body is sturdily constructed but not too compact. The legs are of medium length. Back is straight and level except for a slight arch in the loin area. Head of the RS is more elegant. Scull appears oval, slightly wider to the back if looked on from the top, and flat if looked on from the side. Muzzle is the elongated as is the skull. Head is impressive. Scull is fairly broad, slightly rounded at the sides and back. 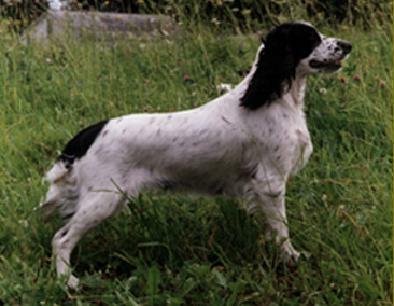 Muzzle is approximately the same length as the skull, medium in length. The coat straight flat, never wiry or wavy. The color is a solid, rich liver or dark chocolate only. Scull profile is flattened, from the front is slightly arched laterally. 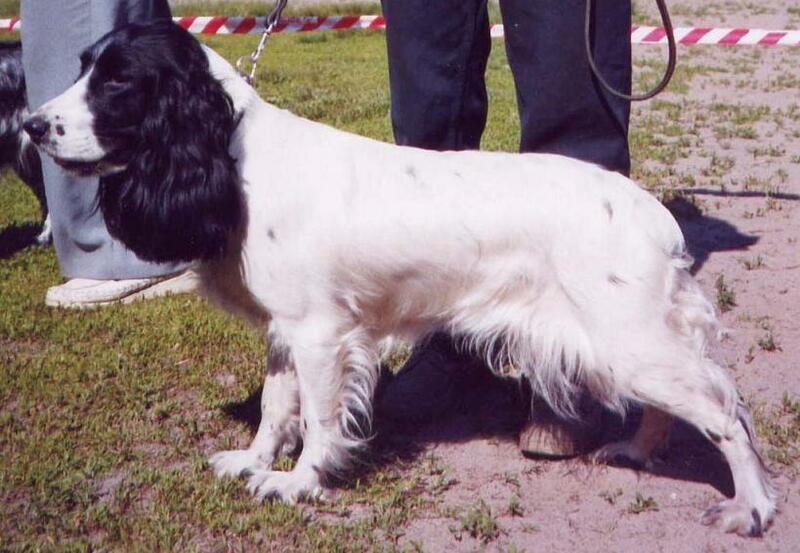 Muzzle is straight, with no inclination downward toward the tip of the nose. If looked on from above, muzzle is wide, slightly narrower than the scull and narrowing a little towards the nose. The jaws are moderately deep.The leather of the ear should be able to reach to the tip of the nose. Scull is arched and slightly flattened at the top. Muzzle is slightly rounded towards the end and is much norrower than the skull, if looked on from above. The jaws are strong. The leather of the ear extends from half way between the eye and nose to the nose. The coat is straight flat and soft to the touch, never wiry or wavy. 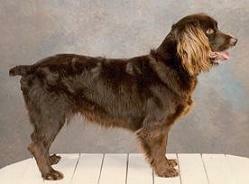 Mostly wavy, sometimes curly or smooth long coat, with thick undercoat. On nape, leathers and croup, often curly. 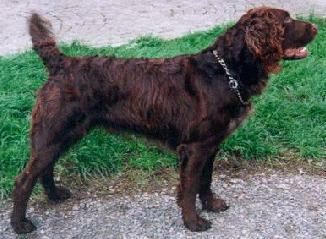 Solid brown, brown roan, and more seldom also red and red roan. Tail is straight, docked at 1/2 length. The tail is only slightly docked: 1/5th to 1/3rd. When the dog is excited, the tail is carried high. Name and owner unknown. 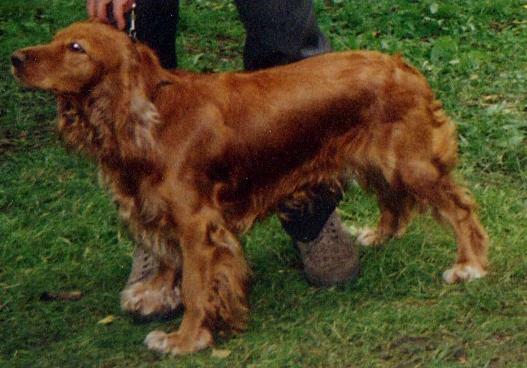 Photo taken at " All Russian Dog Show" in Moscow, 1997. Best of the Breed. Sverdlovsk, Russia. Chelsi-Step-To-Step. Owner unknown. St Petersburg, Russia. 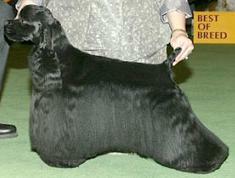 If you have a suggestion on a breed to include here, please let us know: rsclub@hotmail.com.